The Toronto Bike Awards honours excellence in people and organizations that demonstrate leadership in encouraging cycling for employees, customers, and the community. On Wednesday, February 24th more than 150 people gathered at the SteamWhistle Brewing Hall for the Toronto Bike Awards, celebrating businesses and organizations that encourage cycling in our city. Thank you to the Ontario Ride to Conquer Cancer and SteamWhistle Brewing for supporting this special event, and helping us honour those that make our streets safer and our city healthier. See photos of the event here. The ceremony was hosted by Cycle Toronto's Executive Director Jared Kolb and City of Toronto's Manager of Cycling and Transportation Services, Jacquelyn Hayward Gulati, who also gave a keynote speech to kick off the event. We heard presentations from Public Works & Infrastructure Committee (PWIC) Chair and Councillor Jaye Robinson, and General Manager of Transportation Services of Toronto, Stephen Buckley. Award presenters included friends from the City of Toronto, The Bike to School Project, Toronto Centre for Active Transportation (TCAT), Ontario By Bike, Toronto Cycling Think & Do Tank, and Cycle Toronto. A Silent Auction to support Cycle Toronto's advocacy work featured exciting items from Sweet Pete's, Urbane Cyclist, MEC, Steam Whistle Brewing, Zipcar, Biketoons, Bateman's Bicycle Company, Spacing Magazine, Timbuk2, and Singer-Kwinter Law Firm. We celebrated the winners with beer from Steam Whistle Brewery, and The Ride to Conquer Cancer was present to sign up participants for their next ride. Thank you to everyone who came out to the event, and to all the organizations who supported it. A very special thank you to our team of Cycle Toronto volunteers who made the night run smoothly, from helping with registration to manning the drink tickets and silent auction tables. 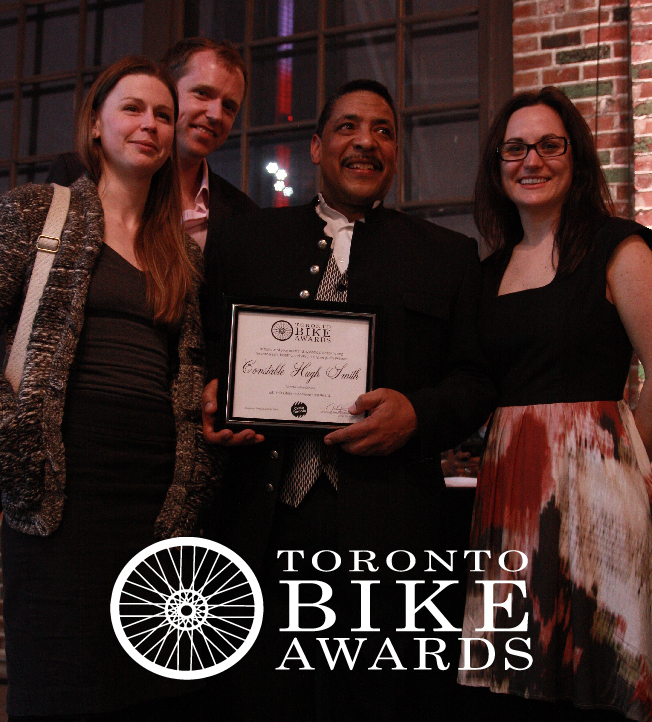 Click here for the 2014 Toronto Bike Awards.